Vinod Nair of Geojit Financial Services said market may extend the rangebound movement as global risk factors like US China trade talks and growth concern continued to gain investor's attention. The market fell sharply in the last week as the Sensex and Nifty corrected a percent each, underperforming global counterparts. Earnings disappointment in ITC and Maruti Suzuki, corporate governance issue at Zee Entertainment and profit booking weighed on sentiment. The selling in banks, auto, metals, infrastructure and FMCG stocks pulled the market lower whereas the rally in energy, defensives IT and pharma limited weekly losses. Earnings will continue to be the key theme this week as well, due to which there could be more of a stock specific action. Apart from that, the most important event to look at would be the Interim Budget 2019. Also, there would be expiry of January futures and options contracts, so volatility could be a major possibility in the coming week, experts said, adding any rally or sharp sell-off could be because of earnings. Globally, key things to watch out for would be ongoing trade talks between the US and China. "Investors will stay cautious ahead of the Interim Budget on February 1 and because of ongoing Q3FY19 earnings season, volatility is expected to remain high. The Interim Budget will be the last one before general elections in April 2019, presented by the current NDA government," Rahul Sharma, Senior Research Analyst at Equity99 told Moneycontrol. Vinod Nair, Head of Research at Geojit Financial Services also said market may extend the rangebound movement as global risk factors like US-China trade talks and growth concerns continue to gain investor's attention. The broader markets underperformed frontliners with the Nifty Midcap and Smallcap indices falling around 3 percent each as the Volatility Index increased by 6.4 percent to 17.69. 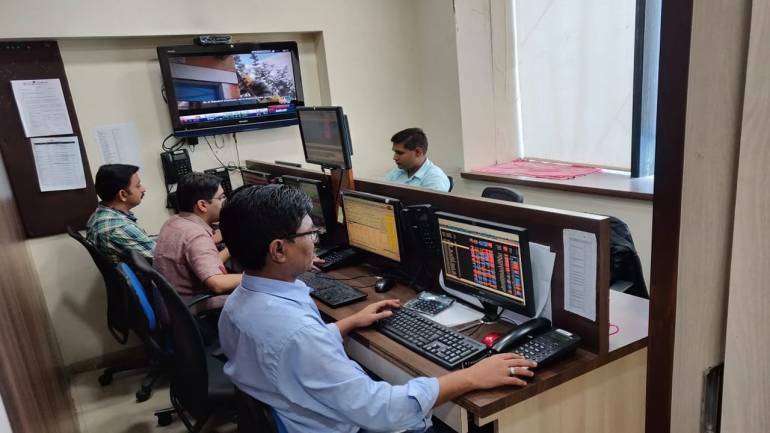 Key stocks that reacted to the news and earnings in the week gone by were Yes Bank (up 11 percent), Sun Pharma (up 8 percent), Reliance Industries (up 5 percent), Zee Entertainment (down 28 percent), Maruti Suzuki (down 11.5 percent), UltraTech Cement (down 8 percent) and Dish TV (down 33.4 percent). Earnings would continue to rule the market for another three weeks and in the coming week, overall around 500 BSE companies will declare their quarterly numbers including 16 Nifty50 companies that are Axis Bank, HCL Technologies, HDFC, Bajaj Finance, ICICI Bank, Bajaj Auto, Indian Oil Corporation, NTPC, Bharti Airtel, Hero MotoCorp, UPL, Power Grid Corporation. State Bank of India, Dr Reddy's Laboratories and Titan Company. Among others, key earnings to look at would be Tata Power, Bank of India, Canara Bank, RBL Bank, Bank of Baroda, Jubilant Foodworks, Dabur India, Persistent Systems, Godrej Consumer Products, JSW Energy, LIC Housing Finance, Dena Bank, Petronet LNG, Berger Paints, MOIL, BEML, Divi's Laboratories, etc. Country's largest private sector lender ICICI Bank is likely to show further improvement in earnings with loan growth and net interest income in double digits. But slippages may moderate and asset quality is likely to be stable in Q3. Profitability is likely to be supported by higher treasury income during the quarter. Kotak Securities expects NII growth of around 20 percent YoY and a loan growth of around 25 percent YoY. Overall credit growth is picking up driven by portfolio buyouts, healthy retail and corporate growth, Emkay said, adding NIMs are likely to be stable in Q3 but may look better in Q4 on the back of heavy NPA resolutions. Slippages could be rangebound between Rs 3,000-4,000 crore as Uttam Galva and Essar Steel Minnesota has been resolved (exposure: Rs 1,500 crore), Emkay said. Motilal Oswal said net stress loans during Q2FY19 stood at 5.9 percent of loans and are expected to decline further as incremental stress addition moderates. Key issues to watch out for would be the movement of watch-list accounts, outlook on asset quality and trend on further relapse from restructured loans, and growth in CASA + retail term deposits. State-owned and India's biggest lender State Bank of India is expected to report good profitability in Q3FY19 against loss of Rs 2,416.4 crore in the same period last year. Loan growth is also likely to be in double digits and slippages may be lower sequentially as most of the stress has been recorded in previous quarters, analysts said. Motilal Oswal expects loan growth to pick up at 11 percent YoY led by growth in retail books and portfolio buyouts. 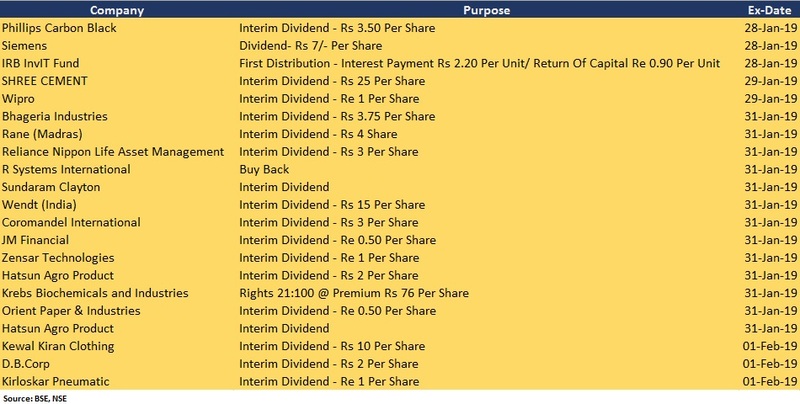 It sees NII increasing 15 percent YoY due to lower interest reversals and better recoveries from written-off accounts. Motilal Oswal said other income is likely to increase 30 percent YoY, primarily on account of an improvement in treasury performance due to sharp moderation in bond yields. This could support profitability. "Slippages to decline to <2.5 percent as recognition of bad loans is largely complete. Gross NPLs could decline with (1) further resolution in power and steel exposures and (2) write-off of bad loans. However, provisions would be high due to ageing of NPLs," Kotak Securities said. Key issues to watch out for would be updates on the retail, SME and agri slippages; recoveries from the resolution of NCLT accounts; and outlook on power assets and macro developments on asset quality. The key event of the week to watch out for would be Interim Budget, which will be presented on February 1 by the Finance Minister.It will be the last budget before Lok Sabha elections. The Budget session will start on January 31 and end on February 13. Given the loss in recent state elections that could jeopardize NDA's win in general elections and unhappiness among middle class and trading community due to poor business growth and little tax exemptions in the past 4 years, there could be more populist measures with a deviation from the fiscal path. "It's election year and financial prudence will take a back seat, the government has to prove to the people that it has their interest at heart and so the Budget is likely to be populist with sops for farmers, the middle-class, and small businesses," Anurag Bhatia, CEO and Head of Investments at Minance said. Prabhudas Lilladher said some of the populist measures could be farm package, annual cash transfer on lines of pension for the families below poverty line, significant increase in standard deduction for the salaried employees or increase in limit under Sec80c and higher tax breaks for housing loans, relaxation in corporate tax rate/long-term capital gains, etc. Automobile companies will declare their sales data for the month of December 2018 on February 1. So Maruti Suzuki India, Tata Motors, Bajaj Auto, M&M, Eicher Motors, Hero MotoCorp, Escorts and Ashok Leyland are stocks to watch out for. The performance of sales for October and November were pretty mixed with subdued data from Maruti Suzuki India. Hence any revival in sales would be key things to watch out for. The futures and options contracts of January will expire on January 31 and traders will roll over their positions to February series. So there could be volatility in the coming week, experts said. Maximum Put open interest (OI) is at 10,800 followed by 10,700 and 10,500 strikes while maximum Call OI is at 11,000 followed by 10,900 and 11,100 strikes. Call writing was seen at 10,800 followed by 10,900 strikes and Put unwinding was seen at 10,500 followed by 10,800 and 10,600 strikes. Hence, Option band signifies a lower trading range between 10,700 and 10,900, experts said. "Nifty short build which was not closed near 11,000 is getting rolled into the February series as well. As certain Nifty stocks are losing sheen, the index may consolidate for a longer time," Amit Gupta of ICICI Securities said. On January 25, Nifty breached its noticeable Put base of 10,800. If the index doesn’t recover immediately, the expiry week may witness selling pressure on account of closure of Put writing positions, according to him. The Nifty50 ended the week 1.2 percent lower at 10,780.55 and formed bearish candle on the weekly chart that implies the index may continue facing resistance on rise around critical resistances. Overall, the index has been rangebound between 10,700-10,980 for past many weeks and the same range is expected to remain in the coming week as well, technical experts said. "The index has closed below all the major moving averages—50, 100 and 200—suggesting selling pressure. However, the ascending triangle formed on the daily chart of Nifty suggests immediate support at 10,740. Recent rangebound movement may persist as ADX on the weekly chart remains below 20," Shabbir Kayyumi, Head of Technical Research at Narnolia Financial Advisors said. Jaydeb Dey of Stewart & Mackertich said the most critical resistance is placed around 10,980. However, breaking down 10,650 also looks unlikely as long as the global scenario remains favorable, he added. Government budget value and infrastructure output data for December month would be released on January 31. Nikkei Manufacturing PMI for January, foreign exchange reserves for week ended January 25, and bank loan and deposit growth for the fortnight ended January 18 will be announced on February 1. 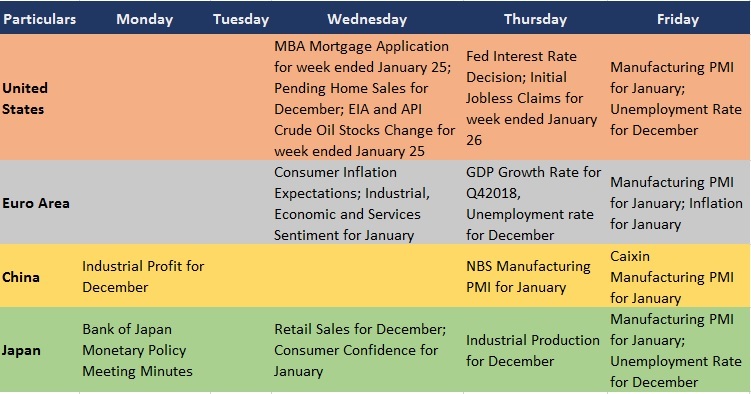 The US Federal Open Market Committee will be meeting for two-days starting January 29 to decide the federal funds rate that would be announced on January 30. Most experts globally expect the Federal Reserve to hold rates not only in this meeting but also in the first half of 2019 amid Chinese growth concerns, trade war issue, etc. Hence, the target range for federal funds rate could be maintained at 2.25-2.5 percent and the commentary would be key to watch out for. After four rate hikes in 2018, the FOMC announced to slow down the rate hikes pace in 2019 taking into consideration the slowdown in the global economic growth. Hence, investors will watch keenly for further rate hikes schedule by the Fed, Prathamesh Mallya of Angel Broking told Moneycontrol.